Two sunday’s before Easter, Sr. de la Columna, the Virgin of Dolores and San Juan are removed from their places in the santuario, wrapped in silk scarves, covered, then carried in an all night pilgrimage to San Miguel for the upcoming Semana Santa celebrations and processions. 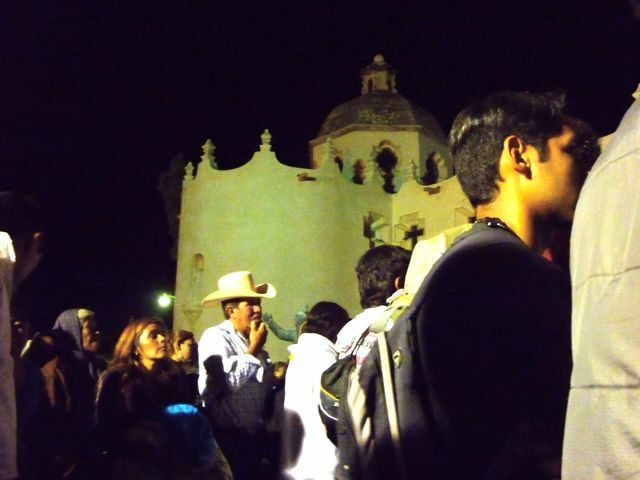 2011 Pilgrimage from Atotonilco to San Miguel de Allende from Suzanne da Rosa on Vimeo. Last Saturday night, my friend Elvia, her son and daughter Roberto and Karen and I accompanied the statues from the church courtyard to San Miguel along with about 20,000 other pilgrims. 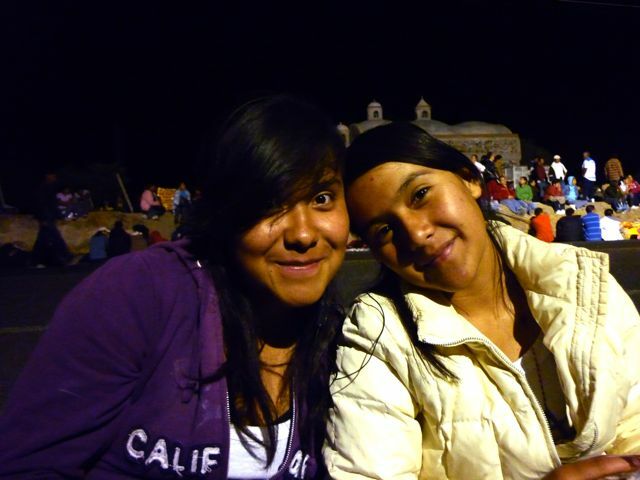 We arrived in the plaza at about 11:30 and waited for the ‘Imagenes’ to appear. At midnight, the bells rang, banners and luminarias were brought forth and the three Imagenes, carried on litters, came out of the church. 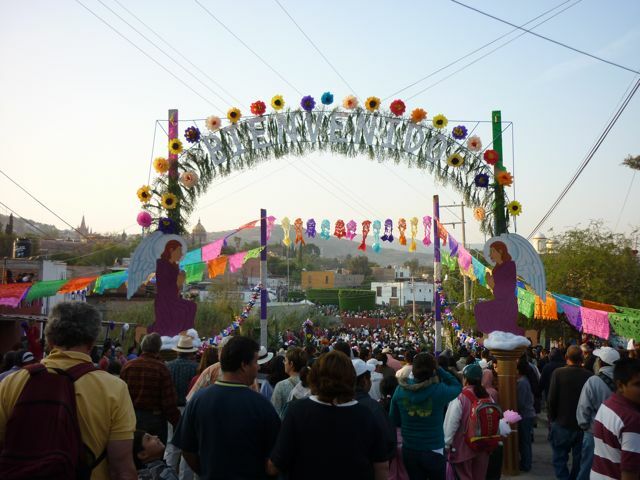 A short mass was projected over a loud speaker and the procession began following the route through el Cotijo, to the capilla on the highway for a 3am mass, proceeding to a small pueblo whose people had decorated the entry with a carpet of flowers and sawdust images with arches of palm and large paper flowers. The participants were varied – elderly men and women, very very old people being held up between two family members, babies carried in arms and strollers, teenagers, adults, groups of men in white hats leading song, women who walked the entire route, 8 hours, all night, in bare feet. After the rosay the procession wound it’s way, accompanied by singing to the top of Avenida Independencia where we were greeted with fireworks, and a mile of decorated street. 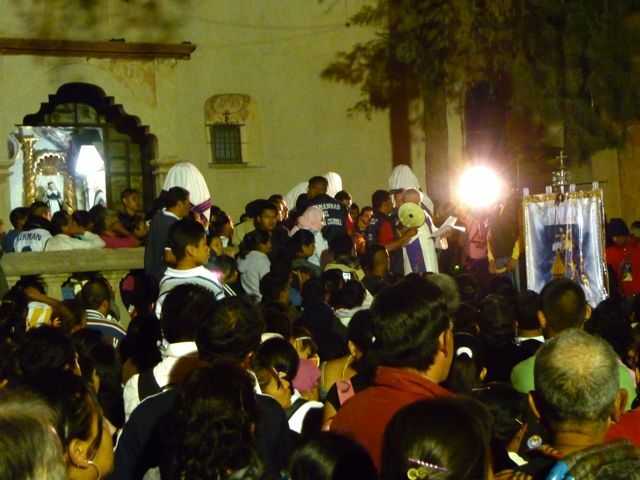 People poured in from everywhere to watch the unveiling and procession to the San Juan de Dios Church at dawn. Go HERE to view the entire slideshow on our old blog. My — I can just sense it. Must do this some day. Thank you for sharing; love what you do.